You can use the Length property of an array to get the number of elements in the array. For a one- or multi-dimensional arrays, the length is always the total number of elements. For a jagged array (array of arrays), the length is the number of elements in the outer dimension. Below are examples of the different ways that you can declare, instantiate, and initialize an array. When you want to pass an array to a method, you could first declare the array and then pass the array by name to the method. You can use the Array.CopyTo method to copy one entire array into another array. The first array must be the same size or smaller than the second array. You specify the index into the second array where you want to start copying the first array. (0 indicates the first element of the second array). 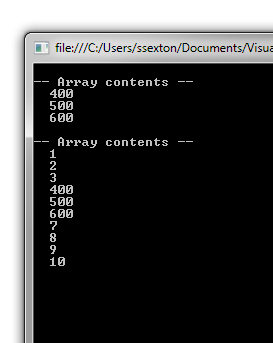 The portion of the second array starting at this index must be large enough to contain the entire first array. Note that if the portion of the destination array that starts at the specified index is not large enough to contain the source array, you will get an ArgumentException. You can only use CopyTo with one-dimensional arrays. 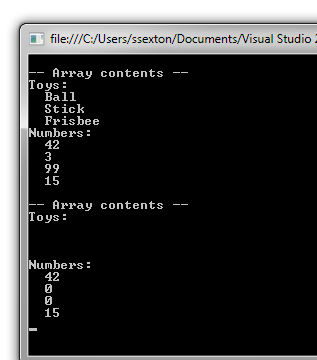 You can clear (zero out) an array or a subset of an array with a call to the static Array.Clear method. You pass the array into the method, as well as an indication of what portion of the array you want to clear. Notice that after we call Clear on the array of string elements, each element becomes an empty string. For the array of int values, the two elements that we cleared become zero. 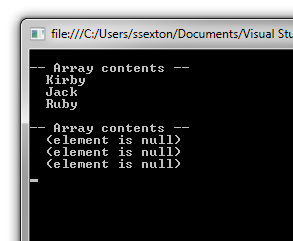 If you call Array.Clear on an array contained reference-typed objects, the values that are cleared become null. In the same way that you can declare an implicitly-typed variable, letting the compiler figure out the type of the variable’s value, you can declare implicitly-typed arrays. In the example below, we declare and initialize both implicitly-typed variables and implicitly-typed arrays. The compiler infers the type–shown in the associated comment.